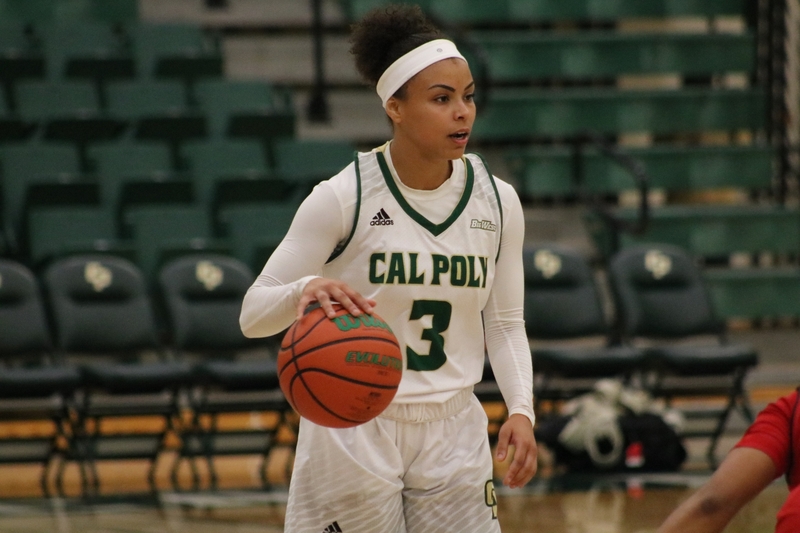 The Cal Poly women’s basketball team has struggled without team captain and senior point guard Dye Stahley for the past two games due to an injury. Stahley suffered a grade 1 MCL tear and a hamstring sprain against Cal State Fullerton on Jan. 19. Without Stahley, the Mustangs (4-13, 1-5 Big West) fell to being tied for last place in the Big West Conference after losses to Hawai’i and UC Irvine last week. “It was definitely hard, especially being a senior, you do not want to sit out any games,” Stahley said. Without Stahley, the Mustangs have been put in an uncomfortable situation. Stahley had started in 38 consecutive games, dating back to the 2017-18 season. The last time Stahley missed a game was Nov. 28, 2017. While leading the team in assists and steals, Stahley is also averaging just over 9 points per game. She has also played seven full 40-minute games. Although Stahley is anticipated to play against Hawai’i on Saturday, Jan. 2, the last two games were a challenge according to head coach Faith Mimnaugh. The Mustangs are averaging a conference-worst 20.8 turnovers per game. Without Stahley, the Mustangs committed 20 turnovers in the loss to Hawai’i and 30 turnovers the loss to UC Irvine last week. In addition, Cal Poly ranks worst in the conference in opponent’s points per game at 70.4. Other than Stahley’s immense experience at the point guard position, Cal Poly is missing her leadership on the court. “On the court, [Stahley] directs everybody and is a very vocal leader,” Mimnaugh said. Freshman shooting guard Alli Hallberg had to take the starting point guard role for the past two games. Freshman Kyra Jacks also stepped up and played the point guard position. “[Jacks] was asked to help us in that area and she has continued to work hard and improve,” Mimnaugh said. “I had faith in them and let them know that I believe in them because one person does not make a team,” Stahley said. With Stahley back in the lineup, Cal Poly will travel to Hawai’i (7-12, 3-3 conference) on Saturday, Feb. 2. Hawai’i is in a three-way tie for third place in the Big West after falling 60-55 to UC Riverside on Wednesday, Jan. 30. The Rainbow Wahine are led by forward Makenna Woodfolk, who is averaging 11.5 points per game. Cal Poly has not had the best of luck when playing Hawai’i in previous years. Last year, Cal Poly ended the regular season by securing second place in the Big West Conference with a 67-61 win over Hawai’i in Honolulu. However, most of the team got gastrointestinal virus, including head coach Faith Mimnaugh, and were forced to cancel multiple practices leading up to the Big West Tournament the following week. Cal Poly was eliminated in the semi-finals of the tournament. “Obviously, it did not work out in our favor, but we came in and we tried to give it our all,” Stahley said. With Stahley projected to be in the starting lineup on Saturday, The Mustangs will be looking to turn their season around.